Went to my favorite used book store last night and picked up some gems. Got into an interesting exchange with the cashier too when he foolishly dissed Joyce, more on that in a minute. [This is] one of those exciting books that flash bolts of lightning across an entire intellectual era and up and down modern history. And then the top book on the pile is a copy of A Portrait of the Artist as a Young Man featuring a whole bunch of critical texts and commentaries from sources like H.G. Wells, Ezra Pound, and more. Definitely will be using this to help construct my Dali-Joyce essay I'm brainstorming on right now. It's an amazing edition of Ulysses that's put together like The Bible or some other great holy book. The arabesques all over the cover are amazing and perfectly representative of the verbal arabesques that twirl throughout this entire epic. And this is the good edition of the text, not the butchered Hans Walter Gabler version. Here's some more pics, check out the gold-tipped pages. It even has illustrations throughout the book from Kenneth Francis Dewey. This one is from the Lotus-Eaters episode. It's a great book to have and read and such a perfect rendition of the monstrous, so thoroughly intricate novel. Before I knew this edition existed, I'd have hoped someone would make one like it. Upon seeing the Joyce books, the cashier said "Well, these will be torture" to which I laughed thinking he was kidding. When it was clear he meant it I said "Nah man, I'm obsessed with this stuff" and he blatantly let out his foolishness with an emotional and insulting blurt of "He couldn't write a coherent sentence to save his life!" I was tempted to crack open to any page in Ulysses and teach him what a random line is saying but he then admitted (if it was indeed true) that he'd tried to read the book once and immediately gave up because it was like gibberish. My girlfriend later revealed that she was amazed at how calm I was when the guy seemed to flat out insult my favorite writer, but I explained that his reaction to Joyce is the same as most people who haven't really tried to read and understand it. It's the consensus, mainstream opinion that he's too difficult because nobody actually dares to dig in. 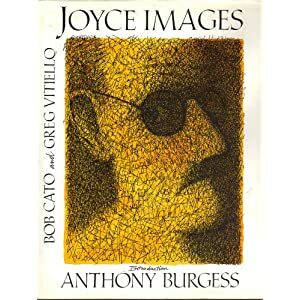 When I was in the cultural utopia of San Francisco last week I also scooped up a few great Joyce books, especially this one of super high-quality old photos, drawings and paintings called Joyce Images by Bob Cato and Greg Vitiello with an introduction by my old buddy Anthony Burgess. The cover is a drawing of Joyce made up of signatures ("Signatures of all things I am here to read.") of the names of Joyce's characters all weaved together. Also got a nice copy of Harry Levin's entertaining study of Joyce (a rare and out of print book) and a newer paperback version of Ulysses to replace my current tattered copy (this was of course before I had bore witness to the huge masterpiece above).